Figure 7.34. 30-day spiral trajectory from Earth and transfer to Mars [ASPL, 2000]. 40 N [Chang Diaz et al., 1999; Ilin et al, 1999, 2000; ASPL, 2000]. Figure 7.33 shows how the rocket thrust and propellant flowrate depend on the specific impulse for a Mars mission spacecraft powered by a 10-MW VASIMR. Figures 7.34 and 7.35 show trajectories from Earth to Mars and vice versa. There are several theoretical advantages in using this propulsion system for interplanetary missions. The main advantage is variable 7sp and thrust at constant power, so this system is adaptable to slow, high-payload robotic cargo mission as well as fast, lower-payload manned missions. The electrodeless design of the plasma generator does away with erosion. If power density will eventually be as high as claimed possible, that and high 7sp can enable trajectories under continuous acceleration, convenient when artificial gravity is desirable. RF heating has been tested in fusion reactors for 30 years, needs high voltage but low current, and is therefore efficient. 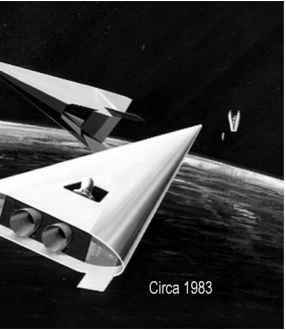 VASIMR has a powered-abort capability, an important point for manned missions. Key technologies recognized so far are superconducting magnets (experiments at NASA-Johnson SC are in fact being currently planned); the power source; a compact and reliable RF heating system; the hybrid magnetic nozzle preventing plasma from heating the walls too much; and the cooling and shielding system (plasma radiates over a broad wavelength region). The second key item points to nuclear power as the source of choice: an Isp of order 104s coupled to a thrust of order 103 N means power must be of order 100 MW. With such on-board power available, storing cryogenic propellants (hydrogen or others), and operating superconducting magnets to save wiring mass do not pose problems in interplanetary missions. RF heating is still a challenge, but past US work to ignite fusion tokamaks (see Chapter 8) can help in this context. Figure 7.36. 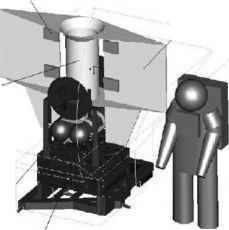 Schematic view of the system for a VASIMR flight experiment [NASA-JSC, 2000].